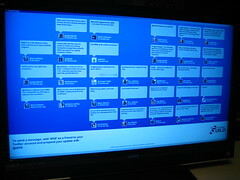 Corporate eLearning Strategies and Development: Twitter board at DevLearn08 - On the bigscreen! Twitter board at DevLearn08 - On the bigscreen! Dan Carr of DanCarrdesign helped us rebrand the interface.